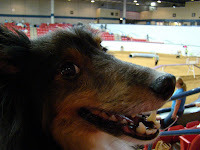 Chase is so excited to be at the agility trial. He hasn't been competing for a few years, but he still had a great weekend! One first place finish out of four runs over two days! We get to do it again next weekend and then he goes back into retirement for a few more years!